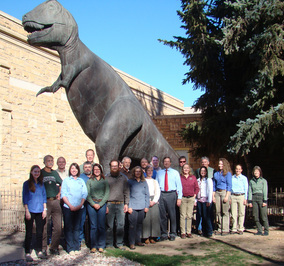 Staff of the Wyoming State Geological Survey, Laramie, Wyo. Many of the Earth’s minerals are used for industrial purposes, but consumers may not realize they also benefit from these minerals in a number of their everyday products. Bentonite and trona are two such resources, with Wyoming being home to some of the largest deposits in the world and leading the nation in their production. Wyoming’s Medicine Bow Mountains abound with geologic features and a landscape that serves as the perfect backdrop for interpretation and road signage. The WSGS plans to create two new signs along the Snowy Range Byway thanks to grant funding received from the Wyoming Office of Travel and Tourism. New mineral investigations. WSGS received funding from the Wyoming Legislature to study several mineral resources, including rare earth elements (a continuation of a recent study), zeolites, lithium, and iron. These studies will include final reports provided to the state Legislature in 2016. Wyoming Oil and Gas Development Map. The WSGS maintains an interactive map on its website for identifying areas in Wyoming where oil and natural gas projects are slated for development, and viewed through Google Earth. Karst research project. Geologists are studying karst and gypsite occurrences (including sink holes) in the Laramie Basin, with a report slated for 2015. Fort Union study. Geologists are researching the Fort Union Formation for potential mineable coal deposits as well as oil and gas resources. Powder River Basin groundwater monitoring study. WSGS continues to compile Bureau of Land Management data for evaluating the effects of coalbed natural gas production on the groundwater resources in the Powder River Basin. StateMap. A project with funding from the USGS, geologists of the WSGS are conducting fieldwork for developing and publishing its annual maps on geology in the state – maps illustrating rocks and deposits found on the surface as well as bedrock geology for specific regional areas. These maps also support the agency’s larger projects related to the research divisions of the WSGS. The next round of StateMap projects under development include preliminary geologic maps of the Rawlins Peak SW and Shamrock Hills 7.5’ quadrangles (Carbon County) and a preliminary surficial geology map of the Afton 30’ x 60’ quadrangle (Lincoln and Sublette counties). National Coal Resource Data System (NCRDS). WSGS geologists are in the process of gathering stratigraphic data from coal exploration and petroleum wells in Wyoming basins as part of a cooperative national database project among states with coal resources. Coal mining companies are also assisting by providing their stratigraphic data related to active mining operations on state lands. The WSGS has published a new field guide, “Self-guided Walking Tour of the Paleoproterozoic Stromatolites in the Medicine Bow Mountains, Wyoming." "Our guided tour will take people to some of the best examples of ancient stromatolites in the world, found right here in southeastern Wyoming," said co-author Don Boyd, professor emeritus with the University of Wyoming's Department of Geology and Geophysics. The WSGS website features a new stromatolites Web page containing the downloadable report, an interactive Google Earth map of the tour stop locations (with photos), and a video with additional photos of each stromatolite outcrop addressed in the guide. 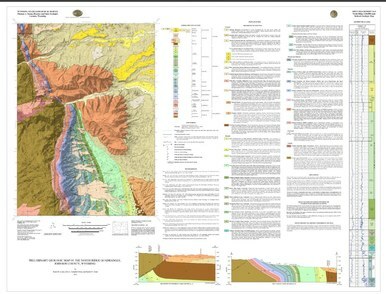 The WSGS has published three new geologic maps under its STATEMAP program. This service is provided to you at no charge by Wyoming State Geological Survey.